The new Locals MAPS.ME web service helps travelers find and get in touch with local guides ready to show off the city and its most interesting landmarks and must-see spots. Tours help visitors learn about a city from the inside out, and capture its true spirit. 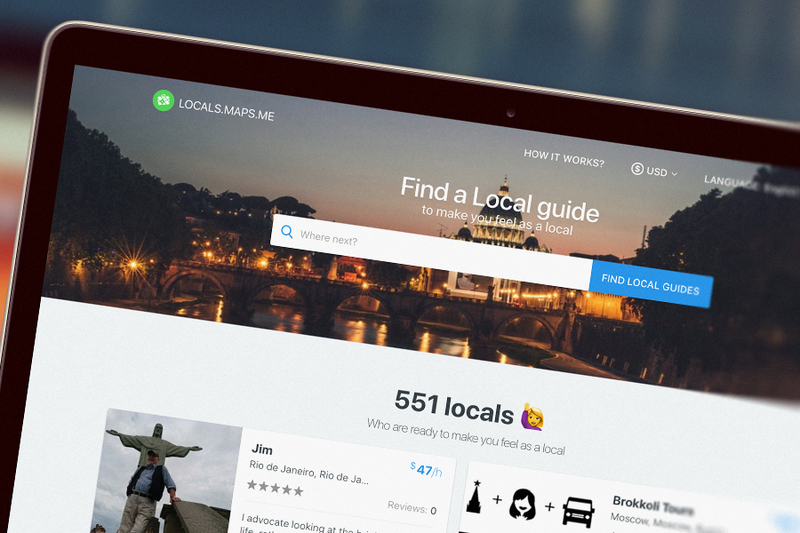 Locals MAPS.ME uses 3 methods to make it easy to find guides no matter what country you're in. First, create a trip indicating the destination and dates of your stay, and wait for offers from guides (they will receive notifications about your interest). Or you can search for your perfect guide on your own – just enter the name of the city in the search bar. Plus, for travelers who aren't used to long-term planning, MAPS.ME can also find a guide wherever you're at. Simply tap Discovery button. Locals.MAPS.ME is full of different offers from local guides: one might know the best pubs in the city, another is a museum expert, while a third can make your shopping dreams come true. Any traveler is sure to find a companion matching their likes and interests. To become a tour guide, just register on the site and complete your profile with as much detail as possible. It is then automatically included in the international database of Locals MAPS.ME. After passing the testing period, more than 500 guides have already joined the project.